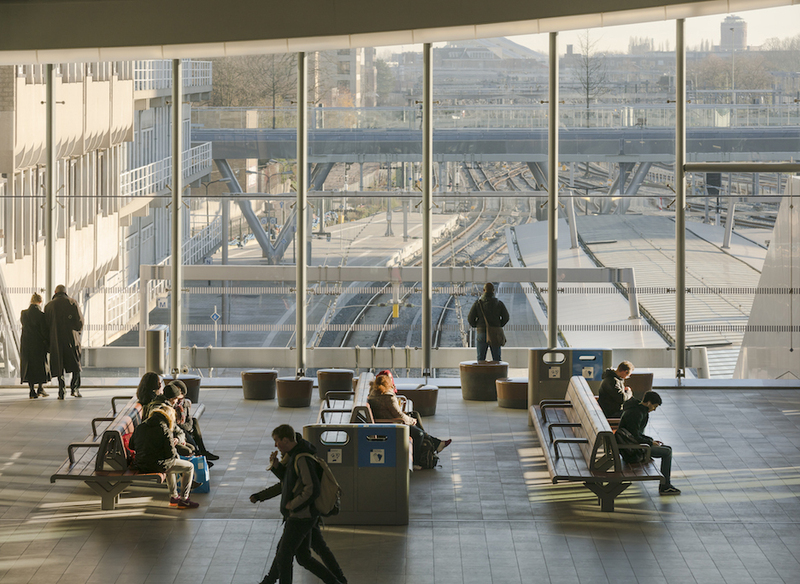 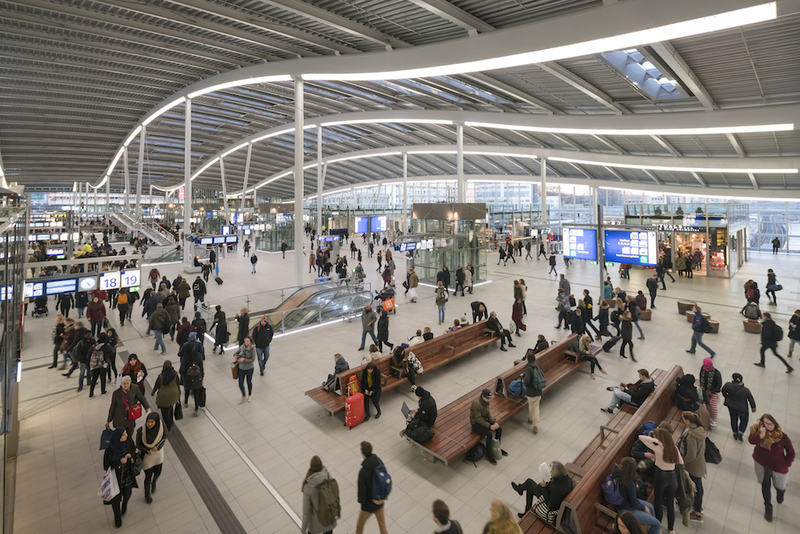 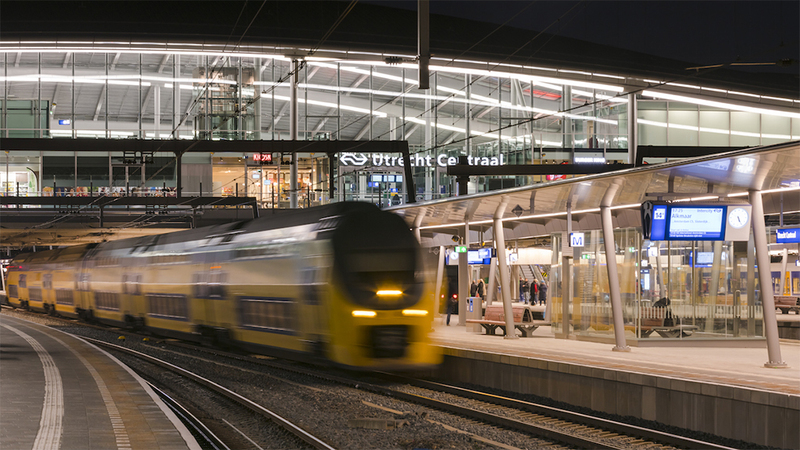 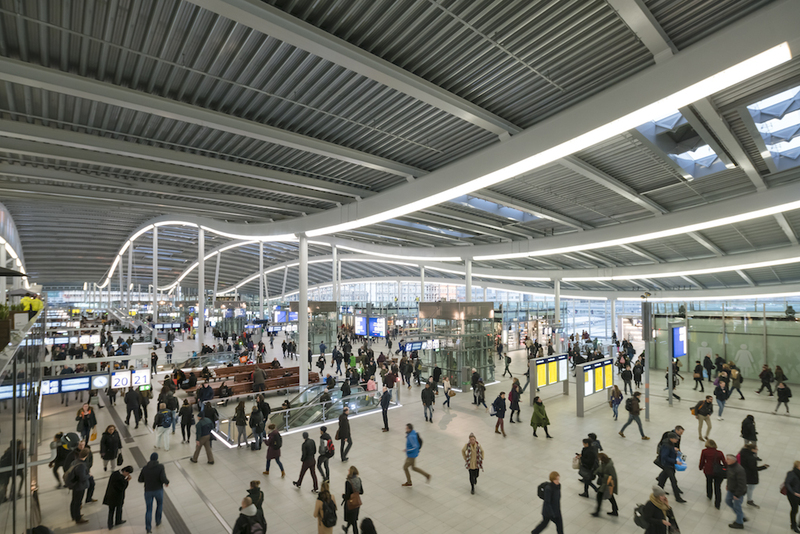 The largest and busiest train station in the Netherlands is officially open. 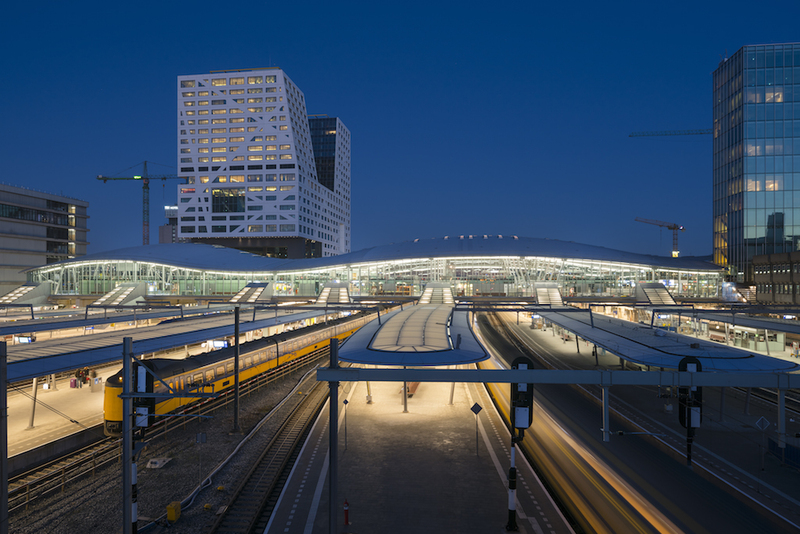 Benthem Crouwel Architects has been involved in the development of the train station since 2003. 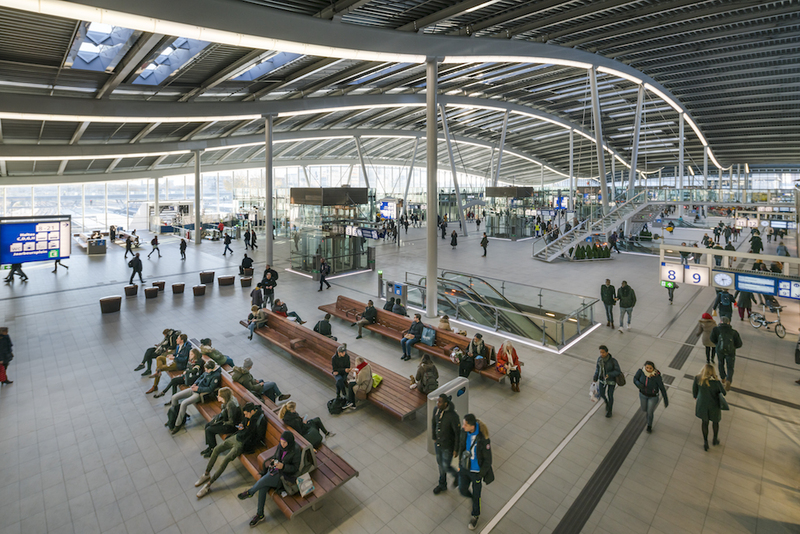 Since the previous building could not handle the increasing amounts of passengers (over the next two decades, the number of travellers to Utrecht Central Station year will grow to about a hundred million per year) Utrecht Central Station has been rebuilt – three times its original size – to one new integrated station complex, which regulates the transport of train, tram and bus. 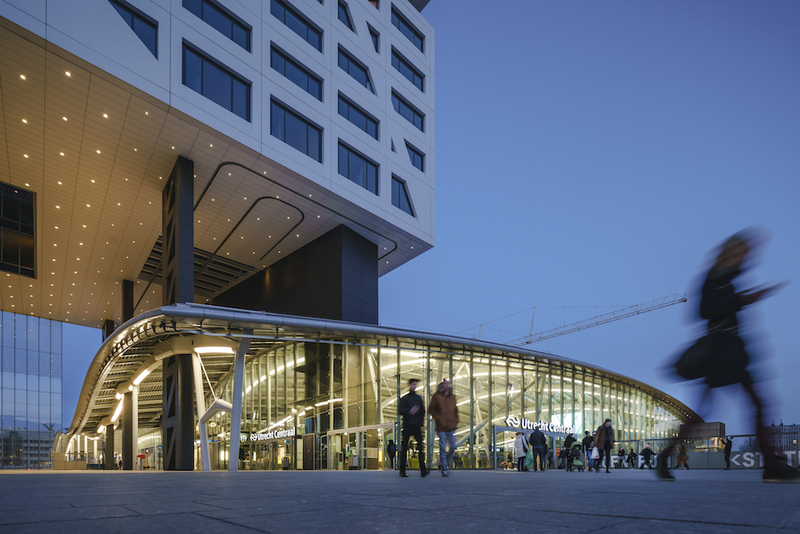 The station has become an autonomous building with two new city squares on both entrances, the side of the Jaarbeurs (convention center) and the city side. 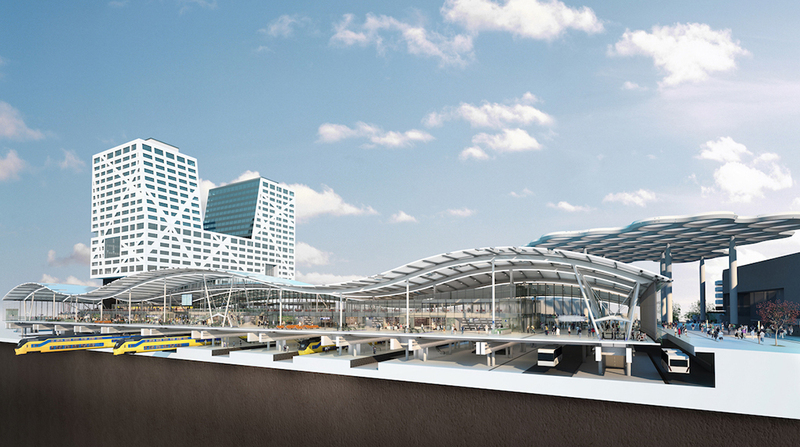 Next year, under the square on the city side, the largest bicycle parking facility in the world will be finished, accommodating 12,500 bicycles. 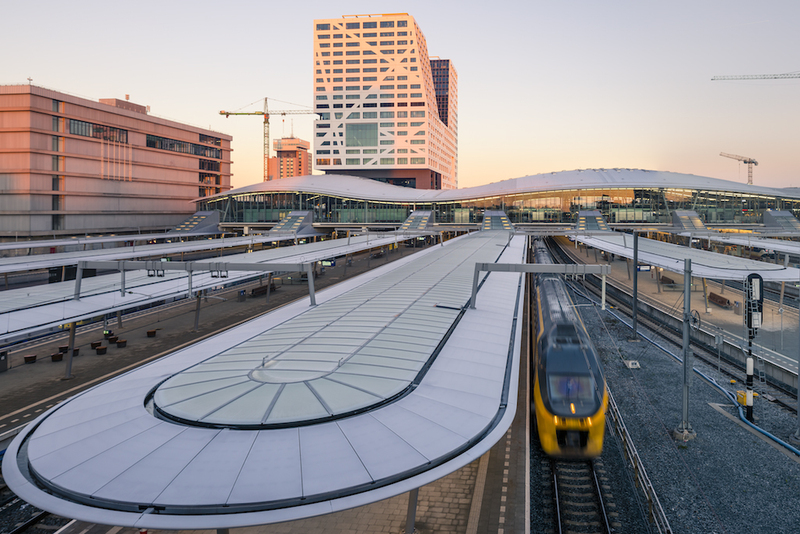 During the design phase Jan Benthem and Mels Crouwel had the idea to design the original flat roof of Utrecht Central Station as a wave that radiates a dynamic movement and also functions as a natural way finder. 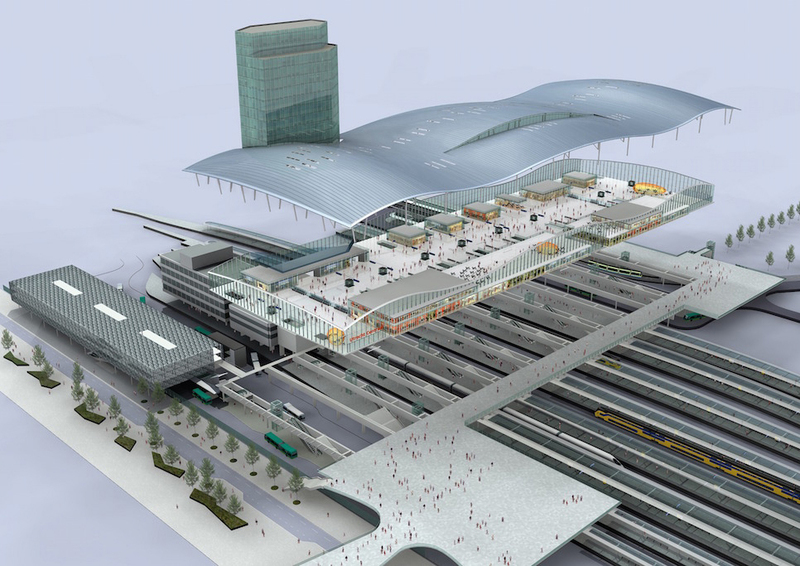 Transverse to the tracks, in the longitudinal direction of the hall, the wave refers to the entrances and exits. 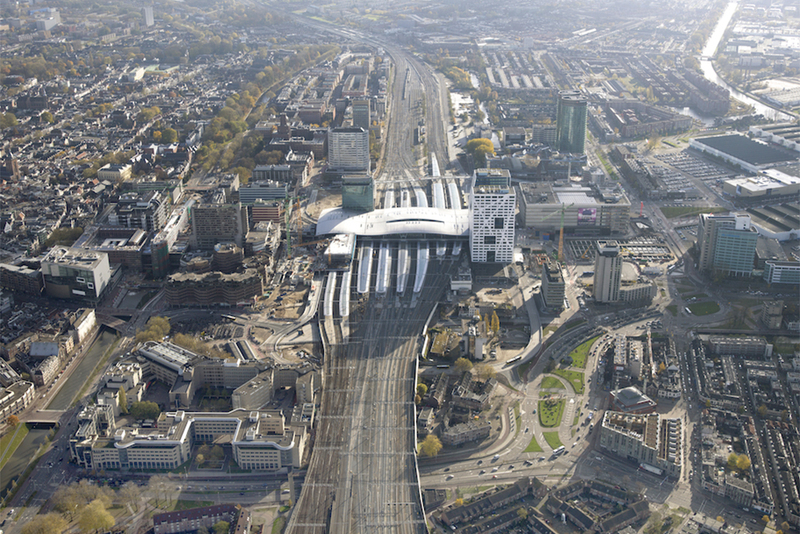 The wave has three ‘undulations’: the highest above the train station, the lower ones on each side contain the tram and bus stations. 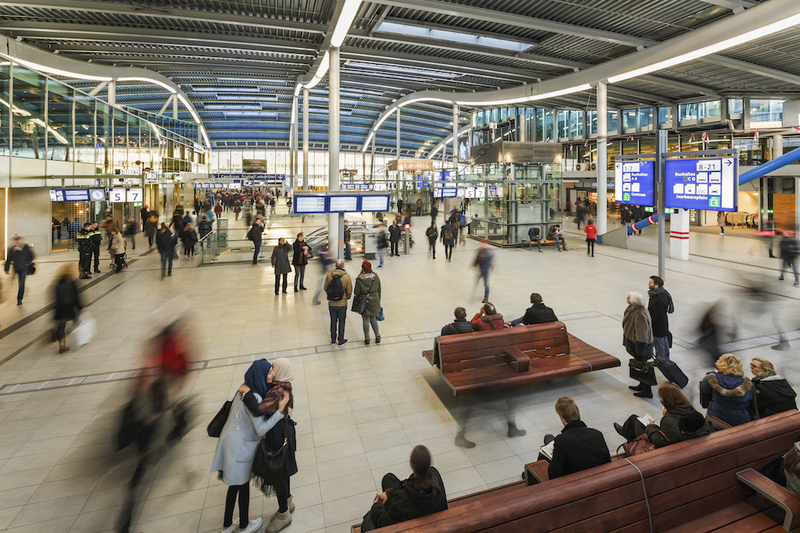 The waves also represent the logical distribution of functions in the station. 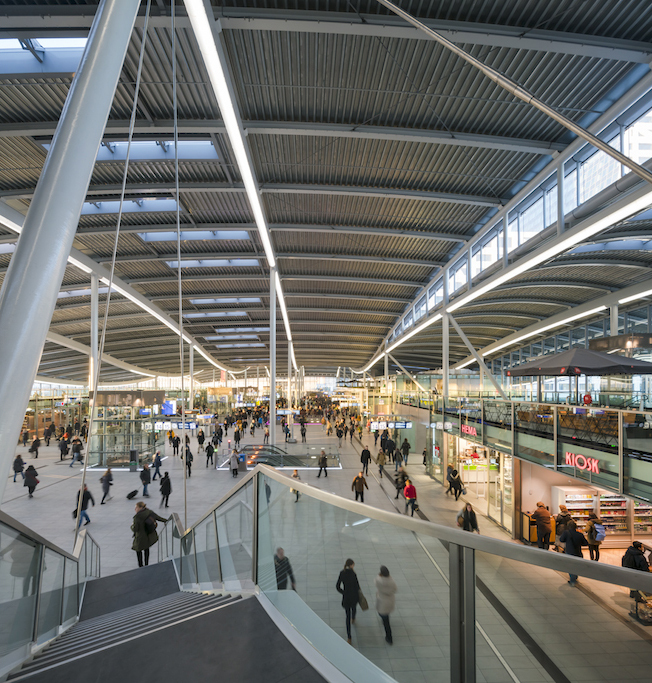 To receive more natural daylight in the terminal, glass skylights were designed, which also function as smoke hatches. 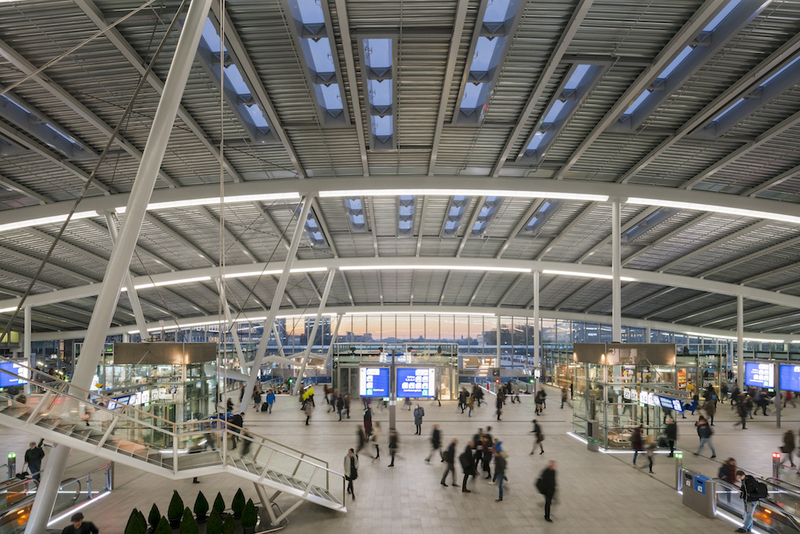 The undulating movement is emphasized by the continuous LED lights on the ceiling. 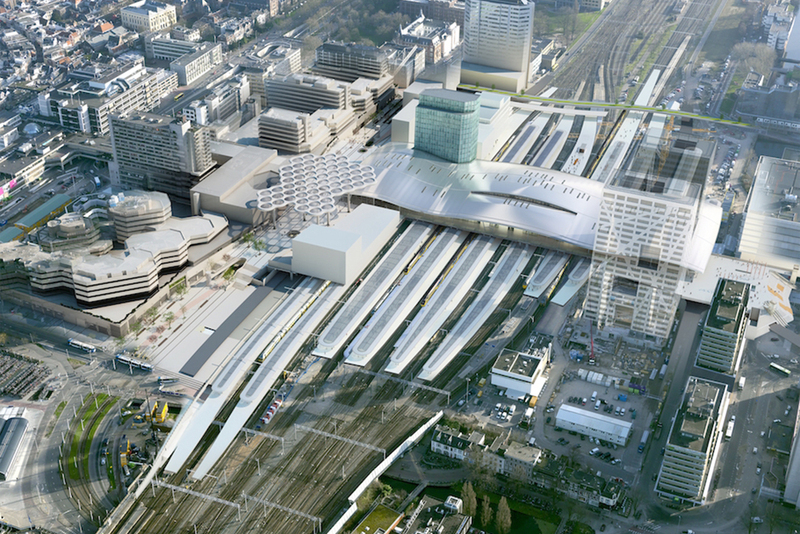 Thanks to the significant wavy shape of the steel roof – and a relative low-rise building (18 meters high) – the station is clearly recognizable among the neighbouring buildings and offices.